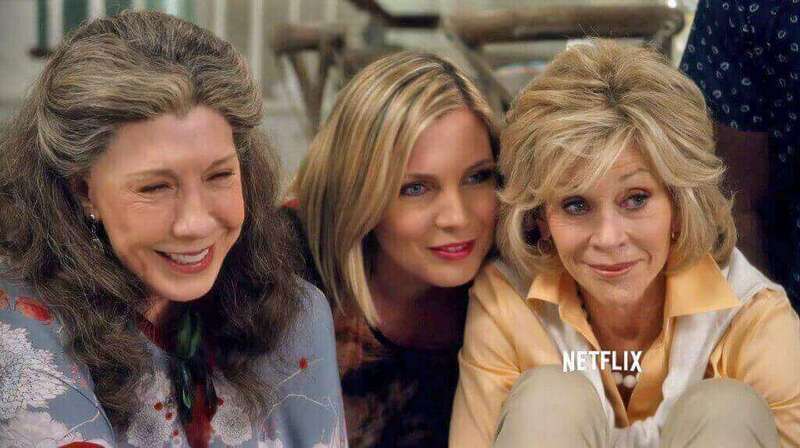 From the outside this program looks like its built from the ground up for a very specific older demographic which isn’t necessarily a bad thing but will it prevent Grace and Frankie appeal to the wide demographic of Netflix users which aren’t in the older age bracket? That’s questions which will be answered when it launched on Netflix in the next few days on May 8th. It’s a very new type of program for Netflix as it’s a lot less serious than House of Cards, less melodrama than displayed in Orange is the New Black and a lot more mature than Unbreakable Kimmy Schmidt. Grace and Frankie began its journey in March 2014 when it was announced to the world that Netlix had ordered a pilot season of a new comedy series produced by veteran Marta Kauffman who has a long list of comedy sitcoms which aired on television but perhaps most dwarfed by the massively successful NBC series, Friends. Casting took place during June of that year with the series in full production by August 2014. The series then finished up in November of 2014 with the season now airing in May 2015. Focussed on two couples who are in retirement the story from the beginning looks like a pleasant one with two close yet competitive couples live their day to day life happy in retirement but that gets squashed as the two husbands come out to being in love with each other. This leads to the collapse of the two wives who then themselves gain a closer relationship as they try to figure out how to deal with this outcome. It will confront many of the problems that people have in their older stages of life meaning it may alienate younger audiences but may be a good way of looking into the future, perhaps. Netflix has pulled an all-star cast here even if it’s been quite a few years since the cast had been in significant titles. Let’s start with Jane Fonda who plays Grace. Jane found her way into a string of popular movies throughout the sixties, seventies and stretched into the eighties too and then announced her retirement in the early nineties. Jane then booted her career back up in the mid-noughties in an array of comedy movies switching from the more serious movies she’d done earlier in the life. Lily Tomlim who plays Frankie shares a long history in the movie business with titles going back to the seventies. However Lily has been grounded in the world of comedy from a much earlier date with probably half of her work being in comedy and a lot of those in childrens movies. Other members of the cast include the two male lead roles including Sam Waterson who’s just come off being in HBO’s The Newsroom and Martin Sheen who’s had a longtime role in The West Wing. Rounding out the cast includes model Brooklyn Decker, Ethan Embry and June Diane Raphael who’s pictured above. This is the most difficult question of them all and for the moment depending on your age demographic we’d say no. It’s got to pull a lot of the right punches for it to be a step above Netflix’s recent comedies so we suggest you wait until reviews start hitting the internet before you go diving into this one. Previous story When will Grey’s Anatomy Season 11 be on Netflix?